So, year by year orange devices fall off but there are still many used smartphones that remain simlocked to the Carrier. If you buy a second-hand iPhone or Android Smartphone from the UK, there is still a good chance you are buying an orange UK locked mobile. In fact, I am talking about Full IMEI Checker, a service which applies to all Wireless Networks. The only requirement is the IMEI number of the mobile you want to check. You can easily find it by calling *#06# or by going to device’s general settings. Carriers and phone manufacturers have special Databases where every info about all mobiles is stored by the IMEI number. Verified IMEI Check providers have authorized access to these databases and get you every detail about the cell phone you are interested in. What do I get with an Orange UK Full IMEI Check report? Barred/CLEAN Status: When a cell phone has unpaid contract bills, is reported stolen or lost, is replaced or is involved in fraudulent activities becomes barred, or in other words, blacklisted. You won’t be able to use any SIM card with this device unless it becomes CLEAN. iCloud Activation Lock Status: iPhones also have the Find My iPhone feature. As long as iCloud Lock is activated, the iPhone can be used only by the person who locked it. 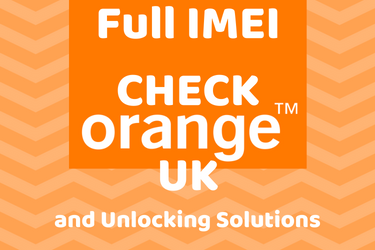 Orange UK Full IMEI Check report will save you from the trouble of buying an iCloud Locked iPhone. Financial Balance Status: Pending contract bills can get the mobile in the UK’s Blacklist. Replaced IMEI/Serial Number Status: There is a shady SIM unlocking procedure where someone replaces the smartphone’s motherboard in order to remove the SIM Lock. After a while (maybe a few weeks), Mobile Networks will find it out through their databases and blacklist this phone as replaced. The IMEI check report will show you the original IMEI and Serial Number of the device and of course if they were changed. How to use the Orange UK Full IMEI Check Report? There are two categories of people who need this service. If you found an Orange UK refurbished iPhone for example from an online marker, local retailer or personal transaction, you should ask of the device’s IMEI number (and proof that it is the correct one when you have to deal with an online market) and check it with an IMEI Check Service. No one will scam you in buying a problematic refurbished smartphone ever again. Of course, if you deal with a local market or a person, just ask to put your SIM Card in and try to make a call. If you succeed then the mobile is unlocked but as you saw there are many hidden issues that can simlock it or even flag it as blacklisted. Every Carrier has its own SIM Unlocking policy. But they will ask you for the info that is included on the Orange Uk Full IMEI Check Report. If you bought a secondhanded Orange UK locked mobile you won’t be able to provide them the correct data otherwise. You can learn everything about EE SIM Unlocking procedure here. Where can I find the Orange UK Full IMEI Check Tool? Certified IMEI Check Providers like UnlockSpector will get you a complete IMEI Check report and if you are too busy to make the SIM unlocking arrangements with the locking Wireless Network, they can even do it for you. If the IMEI Check report shows that your mobile is not eligible for SIM Unlocking (maybe it is blacklisted or iCloud Locked or there are pending contract bills) then there are trusted Network Unlock providers like iPhone Unlock.Zone which gets in talks with the Carrier or uses other legal means in order to unlock your cell phone. Leave a comment below and I will be more than glad to help you. Take care! Hey there, it's Mike P. I am a Chemical Engineer and I totally love science, music & technology. I've spent many years learning about iPhone and Android phone mechanics and SIM Unlocking - Checking procedures and the time has come to share this knowledge with you.